This set of Polymer Engineering online quiz focuses on “Thermal Initiation in Absence of an Initiator and Gel Effect”. 1. What is the characteristic feature of the gel effect in radical polymerization? Explanation: Gel or auto-acceleration effect is accompanied by increasing trend in reaction rate and molecular weight of polymer product, which results into the formation of highly viscous mass. 2. Where the gel effect is generally more evident in radical polymerization? Explanation: The gel effect is more effectively manifested in undiluted monomers than diluted monomer, as non-ideal and unusual effect may be minimized. This effect can be lowered with progressive dilution. 3. Which of the following does auto-acceleration not depend upon? Explanation: The effect is independent of initiator, and so the change in fkd does not give any explanation for this observation. 4. What is the most convenient reason for auto-acceleration effect? Explanation: For Rp to rise, a sharp increase in the kinetic parameter (kp/kt0.5) is acceptable, which may arise due to increase in kp or decrease in kt. Since the values of kt are higher than the values of kp by a factor of 107-105 and due to termination hindrance, the decrease in the value of kt could be the most convenient reason. 5. Consider the consequences of rise in medium viscosity in gel effect. I. There is hindrance to termination reaction. II. The propagation reaction rises rapidly. III. Reduction in diffusion of macro-radicals. IV. Intrinsic reactivity of chain radicals is lowered. Explanation: There is no effective change in the propagation as it involves reaction between a macro-radical and a small monomer molecule. The intrinsic reactivity of the chain radicals remains same. 6. The auto-acceleration in may even lead to an explosion. State true or false. Explanation: The polymerization process associated with methyl acrylate, acrylic acid and acrylonitrile can accompany a huge rise in temperature and may even lead to an explosion. 7. Consider the following graph plotted between conversion and time taken, where benzoyl peroxide is used as an initiator. 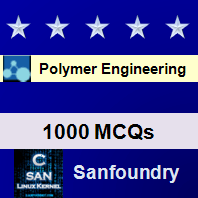 Which of the following curve represents the lowest monomer concentration? 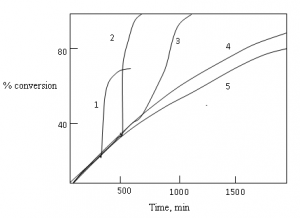 Explanation: The effect of auto-acceleration is eliminated with progressive dilution of monomer by a suitable solvent in the given graph. So curve 5 represents the most diluted monomer molecules. 8. What is the order of initiation reaction in self-initiated thermal polymerization? Explanation: Second order dependence of Rp on monomer concentration indicates that there is bimolecular initiation mechanism involved in spontaneous thermal polymerization. 9. How does the overall rate of spontaneous thermal polymerization vary, when the monomer concentration is doubled? Thus, the rate is then increased by a factor of 4. 10. What kind of chain-initiating active centre is generated by bimolecular initiation mechanism of spontaneous thermal polymerization? 11. The bimolecular biradical mechanism in spontaneous thermal polymerization is very appreciated for its successful attempts to induce polymerization by biradicals formed. State true or false. Explanation: The bimolecular biradical mechanism in spontaneous thermal polymerization is criticized in the view of biradicals being vulnerable to cyclization and in view of unsuccessful attempts to induce polymerization by biradicals formed by decomposition of cyclic peroxy and azo compounds. To practice all areas of Polymer Engineering for online Quizzes, here is complete set of 1000+ Multiple Choice Questions and Answers.